The first fitting of the vintage Vogue sheath dress went as well as could be expected, I guess. I like to fit with both sleeves, so I asked for help. Thanks to Jennifer and Rose for giving me a hand with it. The right sleeve was pinned in with the seam allowance of the sleeve folded inwards, and the armscye on the body adjusted from the pattern. You can see my left side the sleeve is pinned up the way it was cut (right side on your screen)– it looks too wide at the shoulder and cross chest, really falling off the shoulder. On the next test garment I will work out the new armhole. – It may be less of a radical adjustment than this fitting indicates. I won’t really know until I can look at the actual bodice and sleeve pattern on the table. I think the sleeve fits well, I don’t want to increase the bicep… I just have to work on the armhole on the dress side. The bust darts need to be dropped down about 1 ½” – 2” – both at the side dart, and at the bust point of the French darts. I will drop all 3, and lower the waist point as well. There has been a major change in the undergarments one would wear since the 1950’s. I am not just ready for a long line girdle or waist cincher other than for a costume. The 3 little elbow darts on the sleeve are not in the right place for me. – I will have to raise them higher, so that the center one falls at the blue line marked. Since I have a lot of turn back for the cuff at the hem, I will probably just fold out the excess above the elbow all the way across. I think I am going to like the dress length, but will peg it at the hem. You can see the difference in these 2 photos – on the right photo I am holding the skirt in as if it were pegged. Without that, it looks almost A-line as it is originally cut. Hemming can be done in a lot of ways, by machine or by hand. If a garment needs an invisible hem like in woven fabrics, I prefer to hem by hand and to prevent any ridges from the outside I fold the hem edge back about 3/8 inch (1 cm) and work from the right to the left using a fine needle size 11 or 12 depending on the fabric weight. In this example I used Guterman thread and a needle size 11. The sample pants is just one leg so it is small and can rest in my lap. The stitches are sewn about 1/4 inch (6 mm) apart and with loose stitches. I used a yellow thread for better view to show. The hem allowance I use is a bit more than 1 1/2 inch ( 4 cm) , the hem allowance is marked with chalk and fold down and steam pressed. When you want to press the hem again do it from the inside and press only the hem fold edge. Do not touch the hem edge with your iron to prevent a show true from the right side . Sometimes it is easier if I keep my garment away from me on the table instead of in my lap so it looks like this. For a hem in garments where the lining hem is attached to the fabric hem, I use a 2 inch (5 cm) deep hem allowance and use the same hem stitch only this time I fold the hem edge back half way so 1 inch (2,5 cm) and use longer stitches about 3/8 inch (1cm) , there is no need to sew an extra stitch because the hem is secured by the lining hem. The machine stitch line at the bottom is the attached lining . 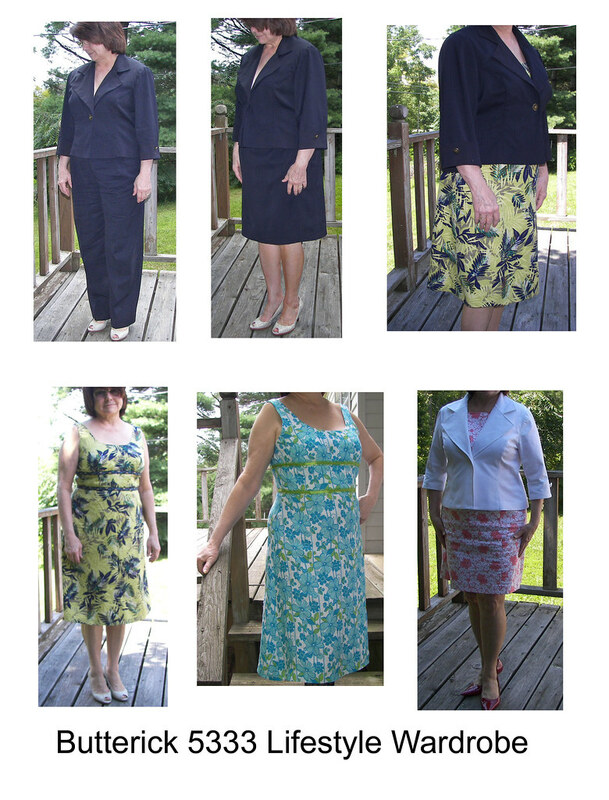 I’m watching every penny these days so I wanted to know how it would be to make a wardrobe from one pattern such as Butterick 5333. Can a wardrobe be made from 10 yards of fabric, one pattern and cost less than $100 including buttons, interfacing and linings? I think the answer is Yes. However, given my self-imposed parameters, it was fun to work out all the kinks and have the results work so well with the rest of my wardrobe. 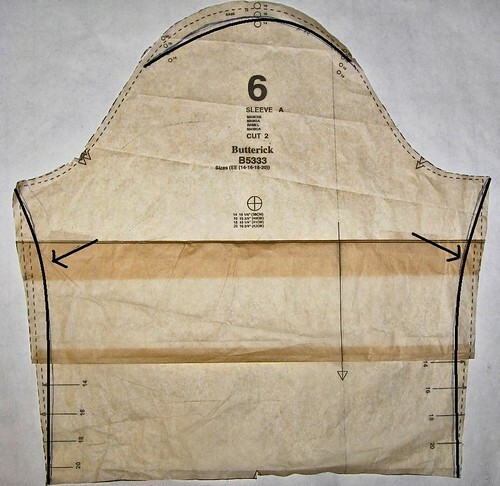 This is functional sewing with rich results if you can make the alterations your shape requires to achieve a well fitted garment. The more I worked with the pattern and became familiar with the Butterick sloper the better I liked my results. Had I not known how to alter, I would have been quite disappointed with the results and might have given up on economy sewing, or sewing, all together. Unlined jacket has princess seams and three-quarter length sleeves with cuffs. Top and above mid-knee length dress have self-lined upper and midriff front and back. Straight skirt, above mid-knee length, has waistband, darted front and back, back zipper. 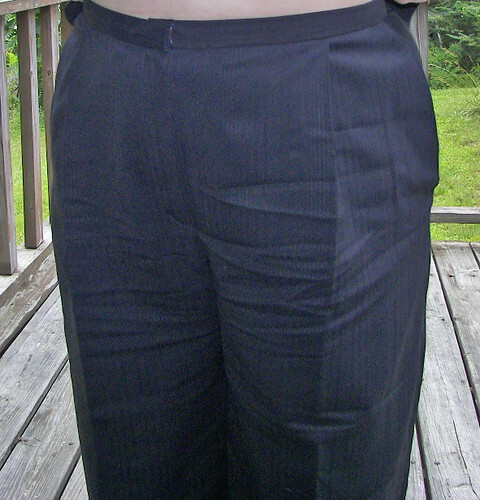 Pants have front pleats, back darts, mock fly zipper, side seam pockets and waistband. My results without making a muslin first. Yes, I am hiding my face…you don’t want to know, and no, I wasn’t in a fight, LOL! 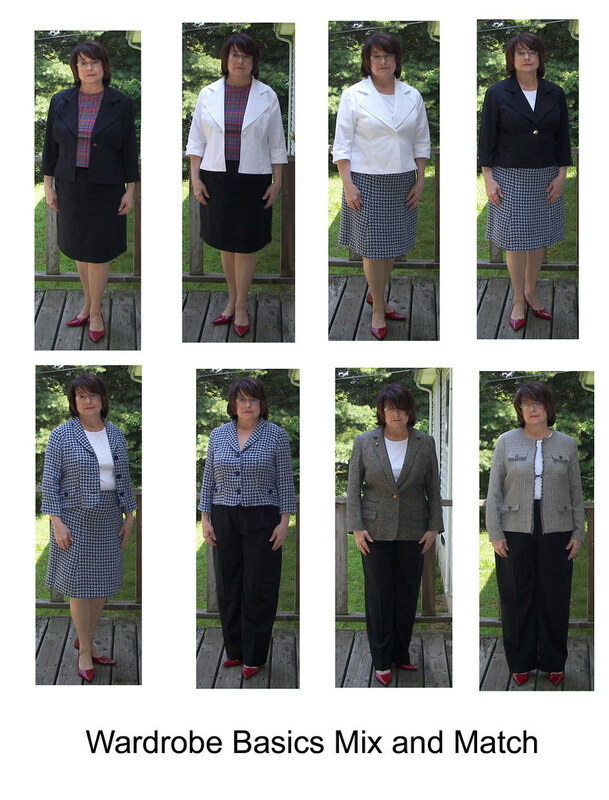 The photos have been greatly enhanced so you can see details and wrinkles of the dark navy jacket, pants and skirt. All these pieces are made from 5 yards of the darkest navy silk/lycra summer weight suiting. It was part of a $8.50 per yard bundle from Micheal’s Fabrics. The fabric has a formal, vintage feel. There are jacquard stripes running in varying widths down the length of the fabric but it doesn’t really “read” as a pin stripe since it is so dark in color. While the lycra gives it some body it also wrinkles easily. I’ve never worked with a fabric quite like this one. I made up the pants first with major alterations to the crotch curve and back leg width. Here’s the finished hip information and having made the pants I can say that the hip measurements do include the pleat width. These finished garment measurements are posted at each major figure measurement circle with a cross. Very helpful! You can compare it to the measurements for each size to determine the ease. However, that is not the total solution it seems to be as my measurements most closely match size 20 but that proved to be too big even figuring in the ease. I made the navy jacket in size 20 with no alterations. It is easy to see (as I saw after I’d finished) that this fabric really needed to be underlined and lined so it would have enough body to support all the extra ease. I think it is too big but the dark color and shoulder pads allow me to get away the fuller fit. The sleeves, however, are a mess! As I worked through construction and fitting I had to continue to down size until the white jacket, my last piece, is a 16 through the bodice, flaring out to an 18+ at the hemline. The skirt also had to be altered to fit but I like the pattern because from the front view it is a narrow skirt but has enough flare in the back that a kick pleat is not needed. It was underlined with organza. It is what I would call a “traditional suit skirt” with plenty of ease for sitting. I then did the dress pattern, the tropical print in silk faille and the aqua one in linen. I ended the tour with another version of the jacket in a white cotton canvas, shown here with a dress from last summer. I didn’t fancy the empire style for a top so I didn’t sew up that option. The finished measurements information turned out to be the best gauge of how the garment would fit when completed. 1. has a well developed derriere with much of the hip width low and to the back of the body. 6. the front pleats on the pants may need to be moved to produce a front pleat that continues on down with the pressed crease to the hem. I chose to have the pleats open to the side seam. The instructions tell you to choose which way they open. Pattern alterations made for sleeve of white jacket. The most economically satisfying part of this exercise? The navy pieces fill a big gap in my wardrobe. The value of having basic pieces in your wardrobe is difficult to monetize. 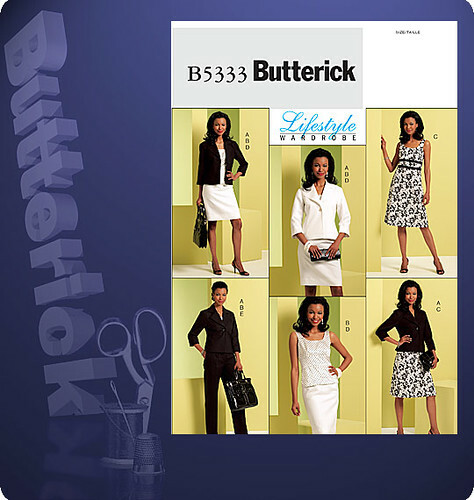 You can see larger pictures of each piece in the Butterick 5333 set at Flikr. Your can also see larger pictures of each ensemble in the Mix N Match set at Flikr. In England, the sustainable movement in clothing is referred to as ethical fashion and textiles. “Greenwashing,”or efforts to get on the ecological bandwagon, doesn’t necessarily benefit the sustainable, ethical movement. Clothing or fabrics are marketed as sustainable, with no standards to support that labeling. Foods labeled as ‘organic’ have some sort of certification process – that is required by law in Oregon – and all organic products in the US that intend to be sold in Oregon submit to this standard. Are eco-friendly fabrics better when there is no attention to dyeing, finishing, or fair labor practice? G: How can we engage people in expressing their creativity or culture? Is there a community model? E: “Every community should embrace its creative class and invest in it…The movement toward creativity and craft is happening everywhere. Building live-work and studio-gallery spaces is a fantastic idea for any community with empty buildings. You also need local businesses that supply artists. Lainie mentions what Natalie Chanin of Alabama Chanin is doing with locally produced fabric and fashion. Elaine Lipson is a writer, editor, textile artist and craftsperson. She is the author of The Organic Foods Sourcebook (Contemporary Books, 2001) and The International Market for Sustainable and Green Apparel, a comprehensive market research report published by Packaged Facts (2008). She blogs about textile art, craft, culture and sustainability at Red Thread Studio . Her work with the organic food industry and the Slow Food movement has led her to translate some of her thoughts to the fiber arts and publish her manifesto Elaine’s 10 Qualities of Slow Cloth at her blog.